Never before has such a gallery of cops, robbers, and daredevil crooks ever been assembled into one collection. 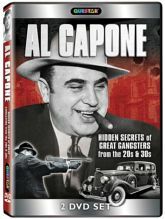 Using FBI and police film, archival footage, and rare photographs, this story traces the life of Al Capone. During the prohibition era of the 1920s, he built an empire that netted over $100 million in one year. The hard times of the 1920s and 1930s brought forth romanticized public enemies: John Dillinger, Bonnie Parker, and Clyde Barrow. It is all here, the dirty deeds of Legs Diamond, Dutch Schultz, "Pretty Boy" Floyd, "Machine Gun" Kelly, and more gangsters - as well as the legendary lawmen who stood against them, including J. Edgar Hoover and Melvin Purvis.